In October 2011, BSI participated in the Coastal and Ocean Airborne Science Testbed (COAST) project headed by a team from NASA Ames, Moffett Field, California (Liane Guild, PI; Jennifer Dungan, PM; and Maryland Edwards, PSE). COAST provided support for NASA's Science Mission Directorate objectives in Earth Science by demonstrating a proof-of-concept in advanced airborne radiometry for satellite calibration and validation. The team was tasked with obtaining "sea truth" for the aircraft overflight. BSI delivered the first COASTal Airborne In situ Radiometer (C-AIR) system—known at BSI as BioAIR—to the NASA Ames Research Center COAST team. 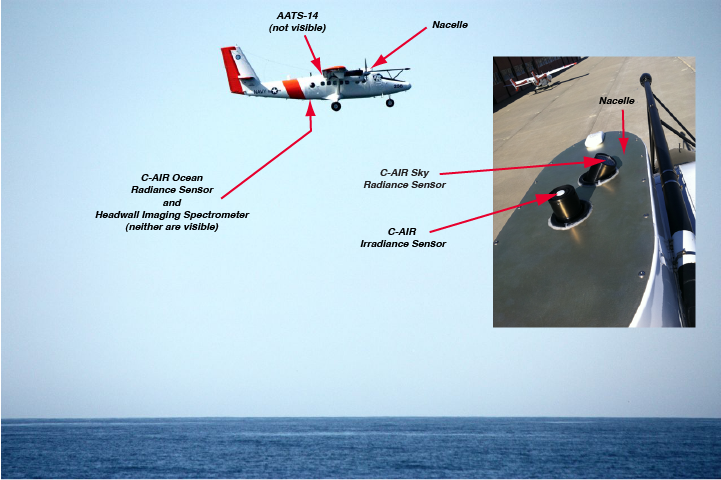 Using a modified UV-18 Twin Otter from the Center for Interdisciplinary Remotely-Piloted Aircraft Studies (CIRPAS), the COAST integration included a customized Headwall imaging spectrometer (Jeff Myers), the AATS-14 Ames Airborne Tracking Sunphotometer (Phil Russell), and the C-AIR instruments from Biospherical Instruments Inc.—all collecting data simultaneously over Monterey Bay during the COAST science mission.